Beautiful horses, pounding hooves, colorful flags, and talented riders. Put them all together and you have exciting fast passed entertainment. What better way to honor the great sponsors of the Springville Sierra Rodeo. With pageantry and precision, the Springville Sierra Rodeo Drill Team opens each performance displaying the logos and colors of the businesses and corporations that make the sport of Rodeo possible. Under the guidance of Dianne Shew and the direction of Sonnie Shew, each member of the drill team donates their time and talent to enhance the presentation of our sponsor to the public. Their dedication and hard work results in fast paced maneuvers, precision turns and all around great rodeo entertainment. 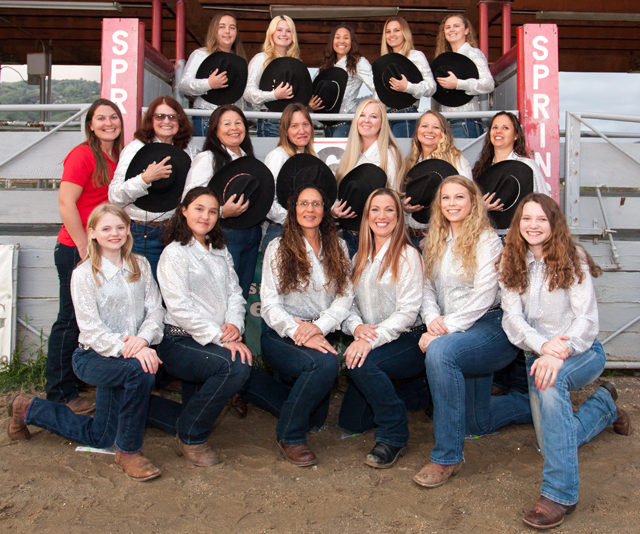 Hats off to the members of the Springville Rodeo Drill Team! Middle Row: Sonnie Shew, Patsy Anderson, Jolene Castle, Laura Grabowski, Jennifer Steinhauer, Tammy Fernades, Brandy Goss. Front Row: Kaylee Cox, Breanna Flemling, Martha Remling, Andrea White, Amanda Smith, Larissa Cox. Not pictured: Alex Shew, Sierra Shew, and Josh Steinhauer.